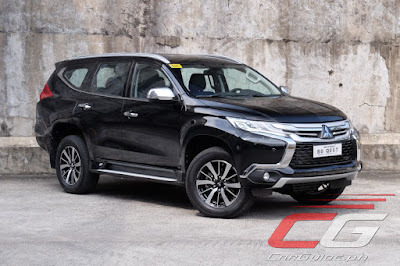 Forget the Mirage siblings, the Montero Sport is Mitsubishi’s bread-and-butter model in the Philippines. Shifting close to 20,000 units of them last year, the futuristic robot-like styling has become a regular sight on the roads. Above all, it’s opened up the mid-sized SUV category to people who wouldn’t consider them in the first place; people who would usually want something sleek or easy to drive. A week behind the top-of-the-line Montero Sport 4WD GT reveals this: it’s the 7-seater SUV that offers surprisingly good on-road manners, a well-thought-of safety package, and excellent value. The first thing that stands out with the Montero Sport is how the interior looks and feels properly built with solid materials and impeccable fit & finish. For sure, there are still remnants of old school Mitsubishi parts, but they have been mixed in with more upscale parts. The leather on the seats are supple, the gauges are crisp and easy-to-read, and the aluminum/piano black accents are modern. Next up, the seating is actually quite good. The front seats are easily the best among its peers—comfortable, supportive, and with electronic adjustment on both sides, provide an ergonomically sound driving position. Those in the second row will largely feel the same way, although because of the theater-style seating, headroom is tight. Moving further back, the Montero Sport shows its weakness with the third row. Not only is the headroom there even tighter, but the tall floor effectively means having to sit there with the knees bent up. Having said that, if ferrying 7 passengers isn’t too much of a priority, the cargo room is usably long and deep, although the rear wheel arches do tend to intrude the opening. Overall, the only weakness comes with the Montero Sport’s lack of usable storage. Although a lockable glovebox and a deep center bin are standard, smaller items such as mobile phones or iPods are harder to store around. For instance, attaching a dashcam means having to live with a power cord that gets intertwined with the power point. And speaking of power points, there’s a severe lack of them in the cabin. When it comes to styling, there’s little doubt that the Montero Sport remains a head-turner. Although not everyone approves of the design, this whole Dynamic Shield concept has made this the most modern looking SUV in its class. It trades some ruggedness for more sportiness, but in a segment that seems to capitalize too much on being “macho”, seeing something sleek and angular is a breath of fresh air. Having said that, visibility is hampered by the sharply raked windshield and the small rear glass. Under the hood of the Montero Sport is Mitsubishi’s next-generation 2.4-liter MIVEC clean diesel engine. Not only is this 4N15 engine quiet and smooth, but there’s minimal clatter as well. It doesn’t get much louder too even as the speeds go up, making conversations between passengers doable. It also exhibits excellent tractability around town. Power delivery isn’t linear, but when the engine hits its stride, it’s punchy. It’s not as relaxed as some of its competitors, but it remains friendly enough for typical on-road use. The accompanying 8-speed automatic is also responsive, shifting quickly and decisively, and this keeps the engine singing happily. The last two gears are rarely used, engaging only at highway speeds, but when it does, it pushes efficiency to 16.94 km/L (average speed 49 km/h). In day-to-day traffic though, it stays at around 8.06 km/L (average speed of 14 km/h). In town, where most buyers spend greater chunks of time, the Montero Sport offers a generally decent ride. It doesn’t get upset by small, undulating ruts while also managing to absorb larger and sharper ones too. It can feel jittery, especially if unladen, but it’s never unruly. And despite carrying a hydraulic power steering system, the effort is light making this SUV feel lither than it is. It’s only at higher speeds that it experiences the occasional choppiness, and on the twisty backroads that body roll occasionally feels a little undisciplined. For those going off the beaten path, the Montero Sport offers a whole slew of features that promises to make it surefooted. Not only does it have Super Select 4WD-II which integrates a center locking differential, but it also has various off-road modes that change throttle and gearing that suits one of five preset terrains. New for 2018 is a trio of features for the 4WD GT, all of which are radar-based safety technology: Ultrasonic Misacceleration Mitigation System, Adaptive Cruise Control, and Forward Collision Mitigation. All of these are welcome, making the Montero Sport the most safety conscious 7-seater SUV in the market. However, a bit of a caveat: The Forward Collision Mitigation system, even at its least sensitive setting, is easily spooked by Manila’s day-to-day traffic. Thankfully, the system can be turned off. Under the new excise tax, mid-sized pick-up based SUVs have really gone up in price and the Montero Sport is no exception. Priced at P 2,162,000, this 4WD GT model does look like one expensive ride. But considering that it comes with a complete suite of safety features plus features such as LED headlights and taillights, 18-inch alloy wheels, dual zone climate control, passive keyless entry, and more, it’s actually pretty great value. While the Montero Sport is let down by its tight cabin, and occasionally truck-like ride and handling, it still manages to stand out because it can punch above its weight class. Despite its hefty price increase, it’s still easily one of the more refined, polished, and well-engineered mid-sized SUVs out there. IMHO. At this price point, the Everest 3.2 4x4 Titanium is the more sensible choice. I’d rather get the kia sorento. Well, you guys are in the wrong article then. Agree with Jonathan Ong 100%. I owned a Kia and a Hyundai. Both disappointments for me. And, you guys ARE in the wrong article. According to google, lither means thin, supple, and graceful. I dont know if the author meant that. 2.2m? The CX5 Skyactiv D is a better choice if you don't need the additional 2 seats which you'll rarely use anyway. Lighter, better drive, more refined, compact size, classier looks, higher quality materials. If you're living in the province, pick the PPV however. The Sportage was my initial choice but they removed several features as of late, including the panoramic sunroof in the GT line, the CRV has a puny engine, and all the others are meh. Just wait after your Youjin is done. The Best Selling SUV talaga ang Montero Sports! Ayoko na dito, pang service lang ng pnp ngayon yan. Kamuka pa ng upcoming expander na auv. That means the Montero is durable for pnp use. Mercedes and Audi are being use as police cars and taxis in Germany and the MidEast. And they're very proud of that. Those are first world countries. And they can afford that. The montero units here are japan donated not chosen because because of durability. Donated? You sure? ..Well, anyway I'm saying it's wrong to hold it against a car brand that allows its vehicles to be use as taxi or police car. It doesn't in anyway cheapen the brand. First world, second or third world is besides the point. ..It shows the brand is confident of the cars durability that it can withstand the rigors of long hours of use. The Montero Sport is good but power is available too high compared to Fortuner, Everest and Trailblazer. You have to thrash it to get a decent amount of acceleration. IMHO. At this price point, the Everest 3.2 Titanium is the better choice. Yet people still like to believe that it has 'the best' ride among the PPVs on sale today. The Everest and new Trailblazer are better than this. Yun nga lang, alergic ang mga Pinoy basta American brand. They must have changed it with the 2018 update. The MUX is cheaper with better features and more dependable midsized Suv. Comes with back seat Dvd screen to enjoy on long trips. Moreover, Bluepower turbocharged diesel to boot. Isuzu pioneered diesel engines making it the most durable in the competition. Yes MuX is cheaper because it actually looks cheap. Headlights palang ng bagong face-lift mukang tinamad mag isip designer. How can the MUX be better when it doesn't even have side and curtain airbags nor a Blind Spot Warning which are basic features for a TOTL variant. Isuzu has been fooling us Filipinos for a very long time now. Truck like ride & handling ... our Trailblazer rides like a luxury SUV! Trailblazer ang suv ng mga tunay na macho. Wow, 20,000 Pinoys have bad aesthetic tastes pala. Sabagay most Pinoy car buyers have an unsophisticated, gaya-gaya mentality when it comes to buying cars. Fortuner sobrang tagtag. Even my colleague, who owns an Innova, when he went with me to visit a client in Subic, his first comment was - ma tagtag dwa yung Montero ko. We were driving through Manila roads with many holes then. But as soon as we hit the NLEX and all the way to Subic, he slowly changed his mind. Now he wants to buy a Montero for his next vehicle. To those who are non-montero fanatics... google nyo nalang kung sino ang mas maraming captured customers-Hyundai, KIa, or Mitsubishi. And am pretty sure these manufacturers are not even close to the sales made by MMPC in their Adventure trim lines... Montero Sport SUV's pa kaya which are like hotcakes nowadays.